Turkey's president put the blame on the Gulen movement for an attempted coup - but what is it? The Briefing Room explores the roots and influence of this transnational Islamic religious and social movement. More than 50,000 people in the military, the judiciary, schools and other state institutions were arrested, sacked or suspended by the Turkish government since the thwarted coup attempt and President Erdoğan pointed the finger of blame at the exiled cleric Fethullah Gulen and his followers. 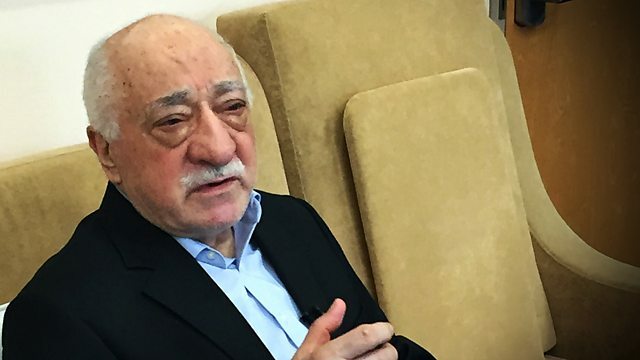 Gulen has denied all involvement - but who is he, and what is his influence? David Aaronovitch talks to experts about the enigmatic movement Fethullah Gulen has inspired and asks how credible his claims of his involvement in the failed uprising are. Edward Stourton, BBC broadcaster and presenter of Islam Inc, a Radio 4 documentary about the Gulen movement. Firdevs Robinson, London-based journalist and former editor with BBC World Service. Gareth Jenkins, writer and analyst based in Istanbul. Ismail Mesut Sezgin, UK-based Fethullah Gulen supporter. What Do Remainers Feel Now?